Pinout for the Geekcreit common cathode Red, Green & Blue (RGB) SMT LED module, from the Geekcreit 37 in 1 sensor module board set kit for Arduino. In some kits this module may be called the SMD LED module, 3-color full-color LED SMD module or RGB colorful LED module. This pinout is for the Geekcreit RGB LED module with a surface mounting LED that has four pins and no current limiting resistors on the module. The LED has a common cathode pin and can display red, green or blue depending on which anode pin power is connected to. Different colours can be obtained by switching more than one of the RGB colours on at the same time. 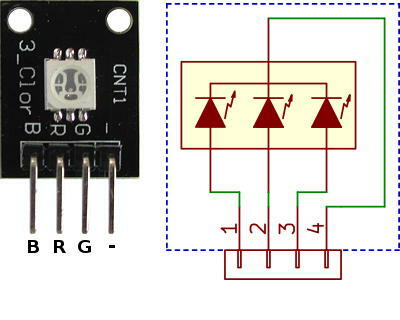 The pinout of the Geekcreit RGB colorful LED module can be seen in the image below. There appear to be two different configurations for this module, depending on which kit it comes from. The difference is which LED colour is assigned to which pin. Some modules have the above pin configuration, but the silkscreen marking on the module is incorrect. In any case it just means that the colours are swapped around and no damage should occur as long as the module is used with current limiting resistors. The module can easily be checked with a multimeter on diode test setting. Each LED colour should light up with the black or COM multimeter lead on the module - pin (LED cathode) and the red lead of the multimeter connected to each LED anode in turn. As can be seen in the circuit diagram for this module, the LED module does not have current limiting resistors on each anode like the through-hole mounting module does. This means that the module must be used with external current limiting resistors.